Gamers with an affinity for Collector’s Edition bundles have yet another premium package to look forward to courtesy of GameStop. 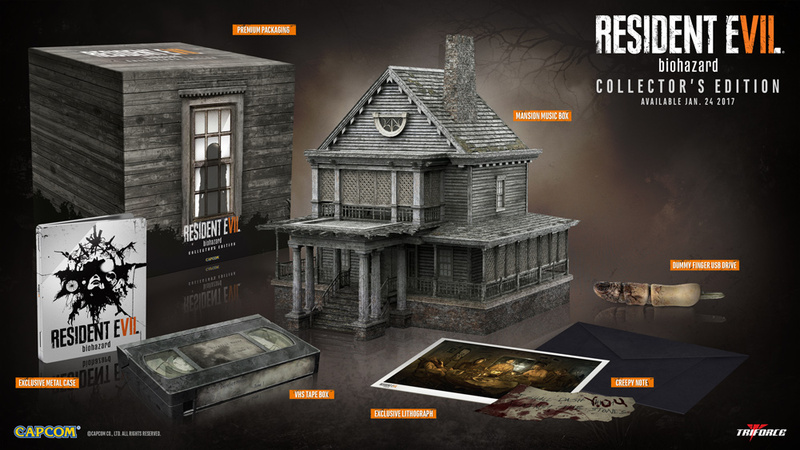 The Resident Evil 7 Biohazard Collector’s Edition includes the base, a miniature replica of the Baker mansion measuring 8” x 7.5” x 8.5” that doubles as a music box that plays a sample tune (Aunt Rhody) from the game with accompanying LED effects, a dummy finger (like the mysterious one in the demo) 4GB USB flash drive, a VHS tape box, an exclusive lithograph, a “creepy note” and an exclusive metal case. The bundle also includes the base Resident Evil 7 Biohazard game – all of which comes neatly packaged inside a themed box with a silhouette of a person in a window on the front. As is customary with Collector’s Edition kits, it won’t come cheap. GameStop has the bundle listed for $179.99 for PlayStation 4 and Xbox One (there doesn’t appear to be a Collector’s Edition for PC). If that’s too much to stomach (and understandably so), you can always opt for the Deluxe Edition for only $89.99 or the standard game for $59.99. With the 11th entry in the core Resident Evil series, Capcom is taking the survival horror franchise in a completely different direction. It’ll be the first to utilize a first-person perspective, a prospect that is both refreshing and downright terrifying if played in VR. Resident Evil 7 Biohazard is slated for release on January 24.